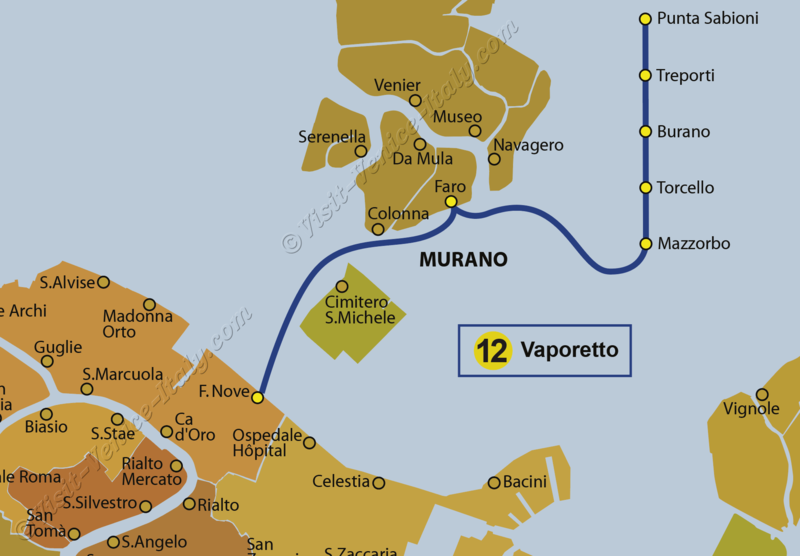 Vaporetto Water Bus line number 12 is a line which leaves from Fondamente Nove to go to Punta Sabbioni, stopping successively at Murano, Mazzorbo, Torcello, Burano and Treporti. Good to know: This water bus has toilets. However be careful, sometimes the journey ends at Treporti and not at Punta Sabbioni. This is also the same for the other direction (Punta Sabbioni-Venice); the departures are sometimes from Treporti only. SD = Stop at Torcello is on request. To board at Torcello, you need to phone 20 minutes before at the 800.845.065 TLJ = Daily - L→S = From Monday to Saturday. SD = Stop at Torcello is on request. To board at Torcello, you need to phone 20 minutes before at the 800.845.065 TLJ = Daily - L→S: From Monday to Saturday. 6:40→6:56 - TLJ = Daily - L→S: From Monday to Saturday.